This is a direct tax proposal introduced in Budget 2017-18 as a measure to prevent abuse of Section 10(38) through sham and bogus transactions. This article talks about Section 10(38), proposed amendment and resulting consequences. Exemption is open to all assessees. Income arises from transfer of a capital asset. Capital assets mentioned above long term capital assets. Transfer takes place on or after October 1, 2004. Transfer is chargeable to securities transaction tax (STT). What does the Budget proposes? The proposed amendment implies that long-term capital gains exemption under section 10(38) is available only if Securities Transaction Tax (STT) has been paid both at time of acquisition and divestment of equity shares. This amendment, if notified will take effect from 1st April, 2018 and will, accordingly, apply in relation to the assessment year 2018-19 and subsequent assessment years. Refer the following diagram to understand it better. If STT was not paid at the time of acquisition of equity shares, the LTCG arising on transfer of equity shares will not be exempt under section 10(38). Proposed amendment applies to equity shares only and no other instruments that are also subject of clause 10(38). Units of equity oriented funds are not covered under the condition of payment of STT on acquisition. 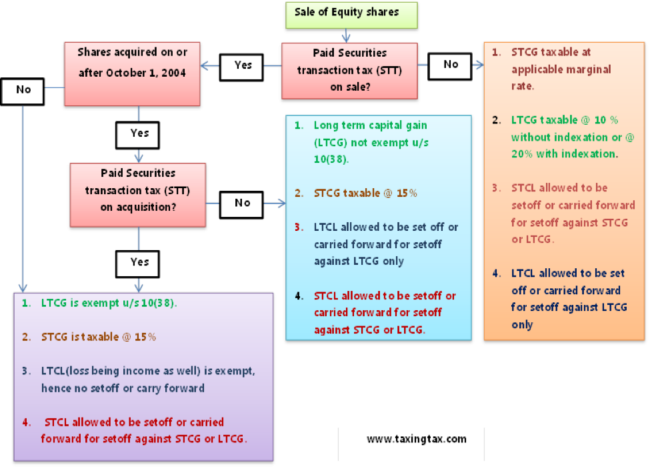 The proposed amendment will affect transfer of only those shares that are acquired after October 1, 2004 without paying STT; logic being STT was originally introduced in 2004. The amendment is retrospective in nature. The assessees who have purchased the transaction off the market on or after 1.10.2004 would now not be eligible to avail of the exemption under Sec 10(38). To protect the exemption for genuine cases where the STT could not have been paid, the proposed amendment makes a point to notify transfers for which the condition of chargeability to STT on acquisition shall not be applicable. The following examples illustrate the impact of the proposed amendment. Suppose, Ankit owned 100 equity shares of ABC Limited received as gift on September 15, 2004. Ankit sells the shares on April 3, 2017 for INR 30,000. In this case, since purchase was made before October 1, 2004, proposed amendment will not be applicable. Long term capital gain will be exempt under Section 10(38). Continuing the above example, suppose Ankit received 100 equity shares of ABC Limited as gift on December 15, 2004 for INR 10,000 and no STT was paid. Ankit sells the shares on April 3, 2017 for INR 30,000. In this case, since purchase was made after October 1, 2004, proposed amendment will be applicable. 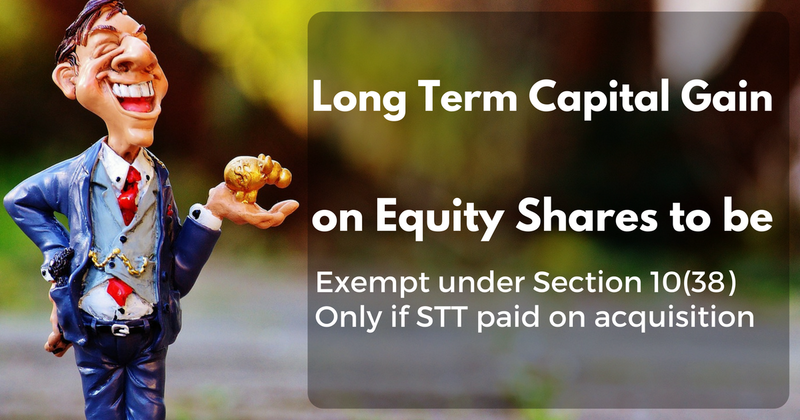 Long term capital gain of INR 20,000 will be not exempt under Section 10(38) as STT was not paid on acquisition. At this point of time, we look forward to the government to notify the list of transactions that will fall out of purview of proposed amendment. Having said that, we believe, even an exhaustive list won’t be able cover the whole kind of genuine business transactions. Also, the amendment will reduce the limited liquidity of illiquid stock which could be sold off the market by creating an uncertainty as to whether the stock could have any future investor. The government seriously needs to think in this regard and come up with an appropriate law so that the proposed amendment doesn’t pose nuisance value for genuine restructuring transactions.